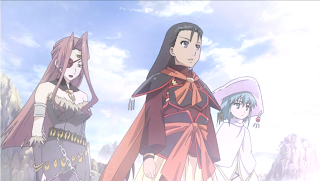 Summary: So, Shakugan no Shana is back for all its fans. It seems to have shifted gears in between the two season. I think they'll go on to explain more of what happened, but, even with out that, the series seems to be picking up steam. Personal comments: Well, this is MY first post on this blog, so I figured I would save it for the continuation of one of my favorite titles. Yes, this is not the EvilCat, but his cohort, danchou. Regardless, Shana is one of my favorite series of all time (and the first series I ever watched subbed), so it hold a special place in my heart. Personally, I loved the first two seasons, but I realize that there are people out there that didn't. Anyways, I think the way the first two episodes have gone could easily fix many of their complaints. Either way, I think this will be a great way to end the series. Horizon on the Middle of Nowhere: Huh?